At the crossroads, Wee Jasper. Photo: Maryann Mussared. Enjoy a great day out with a difference at Careys Caves near the tiny village of Wee Jasper. Part of the Yass Valley, the caves have been described as some of Australia’s most fascinating. The reason? You’ll find a genuine feat of nature and opportunities that you don’t get on most other tours of cave systems. There are seven stunning limestone chambers filled with crystal formations and naturally sculpted rock and it’s an easy 30 steps to access the cave, after which it levels off onto mostly flat cave floors. Guided tours are the only way you’ll be able to enter the caves but they run regularly. Find more information here. There’s a barbecue, kiosk, picnic area and public toilets, so once you’ve had a stint underground there are some wide open spaces for a stretch before the drive home. 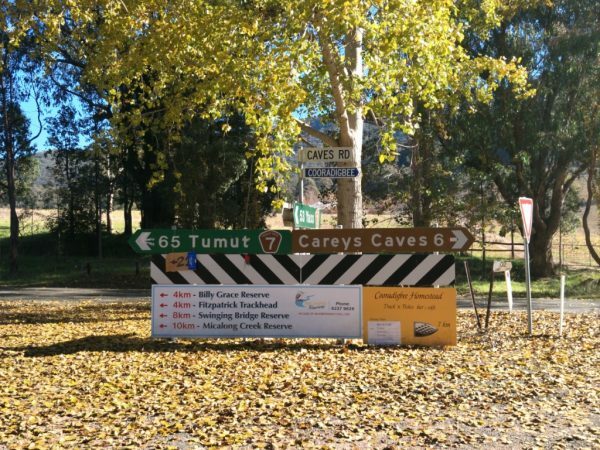 In the Yass Valley and around the caves, there are some campgrounds by the river which are pleasant spots to enjoy a packed or bought lunch or have a stroll. If you’re lucky, you might find there’s a special event happening around the time of your visit. Check out Concerts in the Cave and Music in the Cave to get an idea of some of the more unusual events that the caves have hosted. There are plenty of other things to enjoy while you’re in the Wee Jasper region. Take a look here. Careys Caves is on Caves Road via Wee Jasper, and just getting there is a fascinating journey in itself. The road from Canberra will take you past diverse geological landscapes with some impressive rock formations through picturesque grazing land. It’s a sealed road all the way although it can become quite winding at some points in the journey. The easiest way to get to the caves is via Yass and Wee Jasper. Although this isn’t the shortest route, it is the least complicated and on better roads than the other options. Head north along the Barton Highway, past Murrumbateman and into Yass. Follow the signs to Wee Jasper along Grand Junction Road/Green Street/Wee Jasper Road. Alternatively, from southern ACT the trip via Uriarra Crossing is your best bet, according to Wee Jasper Reserves. There are also back road options for the more adventurous, but grab your maps before you go because smartphone coverage can be intermittent outside Canberra and Yass. The temperature in the caves is at a fairly constant cool temperature so any time of year is a suitable time to visit. Duration: Allow 1 ¾ hours to drive to the caves from the city. Distance from Canberra: Around 115 km from the CBD. Recommended for: Careys Cave website recommends a visit for anyone with an interest in geology, crystallography, chemistry, paleontology, history, visual arts, photography and fun! Are there any other cave systems you think Canberra Day Trips should visit?